The Chung Tai Chan temple (中台禪寺 / 中台禅寺 or Zhōng tái chán sì in Chinese) is a Buddhist monastery located about 40km southeast of Taichung, in Puli in the mountains in central Taiwan. Construction of the monastery began in 1995 and was completed in 2001. With a height of 136m it is the tallest and one of the largest temples and monasteries in Taiwan. 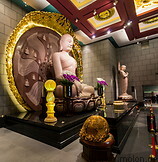 The temple focuses on Chan (Chinese Zen) Buddhism. It's design is rather modern and relatively devoid of ornaments. Near the main building there is small museum.